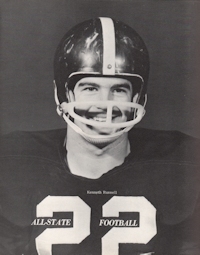 Obituary – Russell, Kenneth Truman « Perry High School Alumni Association, Inc.
Football 63-64, All-State Football 64-65, Basketball 64-65, Track 64-65. Kenneth was born in San Angelo, Texas, the son of Lela Marie Turner and A.B. Russell. His parents divorced and he spent time between living with his mother and father. He spent most of his years living in San Angelo. He last attended San Angelo Lake View High School and was living with his great aunt, Mrs. Opal Turner. While at Lake View, he played football and was a running back. He married and due to not being able to participate in sports due to his marriage, he moved to Perry, Oklahoma and lived with his in-laws. He was the father of Gina Lynn born in 1965. While at Perry, Oklahoma High School, he was named to the Class A, All-State Team, as he had been the leading scorer in Oklahoma for the 64-65 school year. 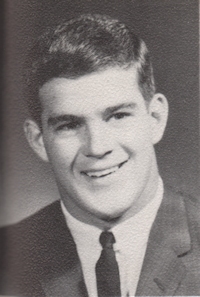 He graduated from Perry High School with the Class of 65 and then attended Conner Junior College of Warner, Oklahoma on scholarship. 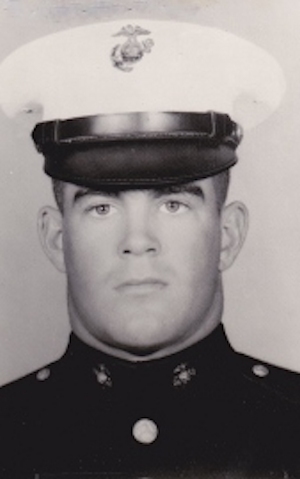 While in college, his marriage ended and in January 1966, he entered the U.S. Marine Corp. He completed recruit training at the Marine Corp Recruit Training Depot at San Diego, California and Infantry ITR at Camp Pendleton, California. He also had assignments at other stateside Marine stations. He began his tour in Vietnam in Vietnam on February 1, 1967 and was assigned as a squad leader with H&S Company, Scout/Sniper Platoon, HQ Company, 26th Marines, 3rd Marine Division. Within a few days after being assigned he was a part of a Battalion Landing Team. Beginning at 8 AM, 16 February 1967, BLT 1/4 conducted an amphibious assault in the coastal area halfway between Tam Quan and Duc Pho in what became known as Deckhouse VI. During the operation, he denotated a land mine and was killed. He was the first casualty of the operation which lasted over several weeks. He was buried with full military honors at the Fairmont Cemetery in San Angelo, Texas. He was survived by his daughter, his father, A.B. Russell, a fireman with the City of San Angelo Fire Department and his mother Lela Marie Bayer of Los Angeles, California. He was also survived by his brothers, Larry B. And Roy G. Russell of San Angelo and his sister, Patty Lee Russell, also of San Angelo. Also surviving were his grandparents, Mrs. Johnie Brazeal of San Angelo and Mr. and Mrs. L.S. Turner of Slaton, Texas. His name is on the Wall at Panel 15E Line 051.